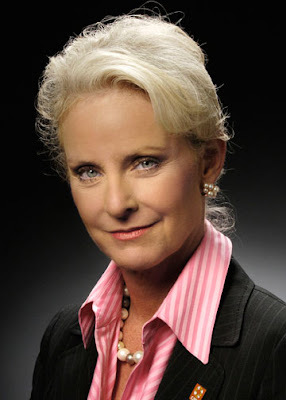 Arizona native Cindy McCain, born May 20th, 1954, is the wife of Senator John McCain. An advocate for children's health care needs, she founded the American Voluntary Medical Team in 1988, and led many medical missions to developing and war-torn countries during the Team's seven-year existence. In 2000, Cindy was instrumental in her husband's notable run for President of the United States. That year, she was chosen to represent the State of Arizona at the Republican National Convention as the Chairwoman of the Arizona Delegation. She serves on the Board of Operation Smile and the Halo Trust, as well as several local organizations. Mrs. McCain has a Master's degree in Special Education from the University of Southern California. A survivor of severe physical ailments and spinal surgery, she is also recovered from a resultant addiction to pain medication. Mrs. McCain is open about the subject, and encourages awareness of the problem in the spirit of prevention. 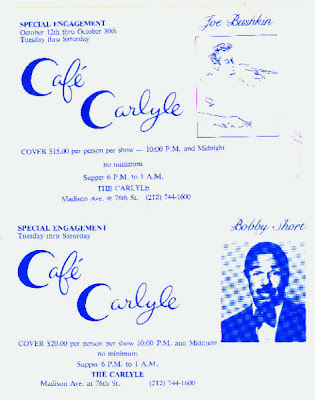 ...I present an old souvenir, probably from my thirtieth birthday, when Bobby Short sang Happy Birthday to me at Café Carlyle. No, this was some years earlier, when Joe Bushkin-- pianist, singer and composer, friend and colleague of Frank Sinatra, appeared at the Carlyle. What an exciting show he put on, which included his signature hit, "Oh, Look at Me Now". The late singer and pianist, Bobby Short had a home in France. He also lived across 57th Street from Carnegie Hall, in an elegant beaux-arts building. He had a lot of sartorial style, great taste, and lived very well. There's a photo of him in an old book about men's wear that we have in our library. He brought happiness to so many people. It is environmentally-friendly, user-friendly, and fun: wine in a box now has appeal for nearly everyone! The boxed wine is contained in a "bladder", and the wine is dispensed through a tap that pops out of the box. Aussies and New Zealanders have been drinking boxed wine for many years, and California has offered good, ready-to-drink wines for the refrigerator and counter-top for a long time. Wine snobs and Francophiles can reassure themselves knowing that in France it is standard to keep a box o'rosé on-tap in the fridge. Good wine brands come in three-liter units. A red wine that doesn't need to age can sit on a counter-top in your kitchen, ready for guests to tap, or for dispensing into an elegant glass decanter. The wine stays fresh because there is no air in the bladder, unlike when you pop a cork on a heavy glass bottle. Speaking of heavy glass, there is much less breakage and fewer bottles in your domicile with a handy box of good wine. To dispose of the container, cut and fold the box, "recycle" it, and toss the now-tiny bladder that used to hold your excellent wine. Napa Valley, California makes some excellent boxed wines. It is environmentally-friendly, user-friendly, and fun: wine in a box now has appeal for nearly everyone! The boxed wine is contained in a "bladder", and the wine is dispensed through a tap that pops out of the box. Aussies and New Zealanders have been drinking boxed wine for many years, and California has offered good, ready-to-drink wines for the refrigerator and counter-top for a long time. Wine snobs and Francophiles can reassure themselves knowing that in France it is standard to keep a box o'rosé on-tap in the fridge. Good wine brands come in three-liter units. A red wine that doesn't need to age can sit on a counter-top in your kitchen, ready for guests to tap, or for dispensing into an elegant glass decanter. The wine stays fresh because there is no air in the bladder, unlike when you pop a cork on a heavy glass bottle. 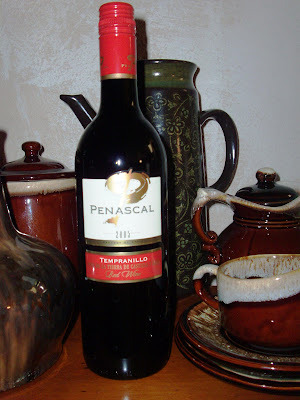 Speaking of heavy glass, there is much less breakage and fewer bottles in your domicile with a handy box of good wine. To dispose of the container, cut and fold the box, "recycle" it, and toss the now-tiny bladder that used to hold your excellent wine. Instead of dumping your overcooked pasta--the result of an emergency elsewhere while you should be watching the pot--drain it well and sauté it in butter, then add grated cheese if you wish. It will have a toasted flavor and stiffen up a bit if you brown it as shown. Sautéed in butter or olive oil, overcooked spaghetti or pasta can have a nice texture. You may even add the sauce of your choice after it is browned. A little butter won't kill you, but an Italian, faced with mushy pasta, might! Additionally, you can purchase classic movies for a few dollars apiece and create a movie library. Considering what is actually available on premium cable television, and the abundance of things you would never watch but are paying for nonetheless, it's worth cutting from your budget. A well-made shoe can last many years. Especially useful are classic styles, which are increasingly rare. Potatoes: the much-maligned tubers aren't guilty of fattening us. The added fats in potato-preparation are the culprits. This humble vegetable that grows low on the ground is high in nutrients. The potato is high in a substance called "resistant starch", a carbohydrate which has a low glycemic index and acts as fiber. A potato supplies more potassium per ounce than a banana. Potassium helps to regulate blood-pressure and blood-sugar. Potatoes also contain vitamin C, B-6 and about 60 anti-oxidants. Peel and cut into quarters or eighths, as many potatoes as you think you need for dinner. The cut potatoes should resemble chunks or nuggets. One potato per person is a safe bet; the leftovers can be re-heated and eaten the next day. Boil water in a pot, with salt or chicken bouillon to your taste. Add the potato chunks and boil them for twenty minutes. Drain potatoes and then sauté them in butter or the fat of your choice until brown. Alternatively, you may coat the potatoes in lemon, olive oil and salt, then bake them on a cookie sheet until brown. A good way to evenly distribute the coating is to put the potatoes, oil and seasoning in a Zip-Lock bag and shake gently, being careful not to break the potato chunks. Baked or sautéed, these potatoes are soft on the inside, and crispy on the outside. They offer "Topanga" trousers made from the same herringbone-weave cotton. Beware, though--like 90% of Cabela's slacks and skirts, they are low-rise, meaning they land below the navel. 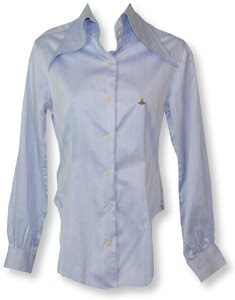 I can see this rugged yet elegant jacket combined with a long, cotton or denim skirt, and a white, ruffled blouse. One may be able to get through the gate at Ascot while not observing traditional rules, but if a woman wishes to look proper and elegant, she will follow them. A knee-length, or mid-calf fitted dress or suit with long sleeves and modest decolletage, stockings or tights, closed pumps, and a hat that covers the crown of the head will ensure a warm reception. Gloves are optional. Wearing a mini-skirt, jump-suit, slack-suit, sun-dress or spaghetti-strap cocktail dress may inspire derision, together with unflattering class-identification. My mother gave me a booklet in 1985, when it was published: Kitsi Finnish Foodways, a publication of Suomi College (now called Finlandia University) for FinnFest 1985. My copy of Kitsi is yellowed. Mother never made squeaky cheese, but she did draw the illustrations on Kitsi's cover. Leipäjuusto is an unusual creation that I really like with rye bread, when in Finland. 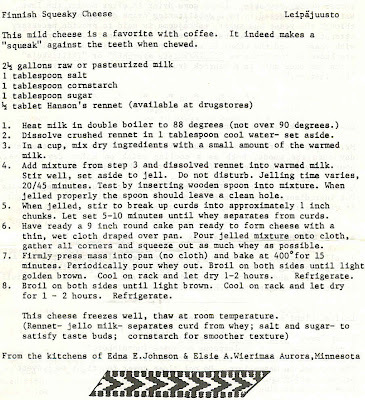 Here is the recipe for making your own Finnish Squeaky Cheese. 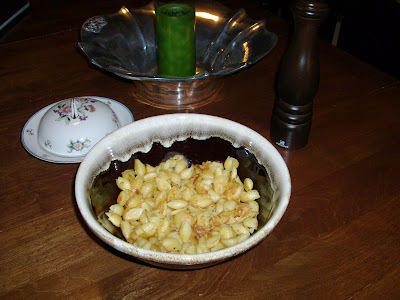 Update: I've just found my mother's friend, Beatrice Ojakangas' blog, where she hosts a richer recipe for leipäjuusto. see this. Why couldn't they put a model in this one? Because no one wants to be seen in it! And, from their page lauding jeans as a classic: they finally mention something I have been writing about for three years, the muffin-top look, but get it wrong. Just because women have been willing fashion-victims for the past ten years and worn slacks, jeans, pants, trousers and skirts that are hip-huggers without actual waists, it doesn't mean that the reappearance of an actual waist constitutes "high waisted" items. I wish these brainwashed fashion reporters would use the correct nomenclature. Clothing that is suppressed at the natural waist is NOT "high-waisted". This idiocy has been reported here on Elegant Survival more than once in the past few months. High waists are Empire-style, just below the breast, and do just as much to create a big-bellied look as the hip-hugging biker-jeans and "drop-waists" have been doing throughout recent memory. Empire waists create a bulge underneath them, as hip-belted clothing creates a huge belly above it. Want a false pregnancy? Get an Empire-waisted dress or blouse. Then you can pretend that you have an illicit bun-in-the-oven, and are awaiting a Victorian-style punishment. Fashion-victims are masochists, are they not? In the event of a power-outage, or complete disaster, you will need certain non-electric kitchen tools. Let's say that you've successfully put away a stock of wheat. You will need to grind it for flour, or crush it for salads and pilafs. The traditional heavy metal meat and vegetable grinder, which attaches by vise to a table or counter-top, is necessary. 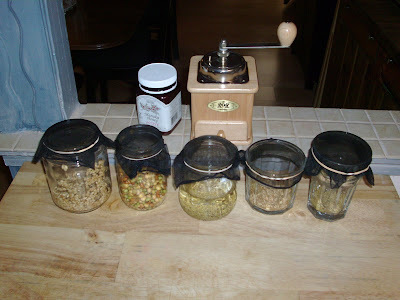 If you have stored-up a load of coffee beans (whole coffee beans, like wheat "berries", have a much longer shelf-life than their ground forms), you will need a high-quality, hand-operated coffee grinder. 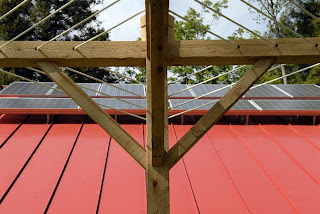 See my Survival Tools link-list on the right side of this page for sources. A great way to always have some form of cheese, without refrigeration, is to buy economy-sized containers of grated Parmesan cheese--the kind which comes in the plastic cylinders. Kraft has a nice product; check its packaging for shelf-life prospectus. As in my previous posts about dehydrated foods, et cetera, I'm not posting this information for food-snobs, but for people who wish to be prepared for disaster!